The End of Ignorance conceives of a world in which no child is left behind – a world based on the assumption that each child has the potential to be successful in every subject. 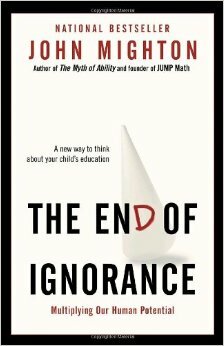 John Mighton argues that by recognizing the barriers that we have experienced in our own educational development, by identifying the moment that we became disenchanted with a certain subject and forever closed ourselves off to it, we will be able to eliminate these same barriers from standing in the way of our children. John Mighton, the author of The Myth of Ability, is the founder of JUMP Math, a system of learning based on the fostering of emergent intelligence. The program has proved so successful an entire class of Grade 3 students, including so-called slow learners, scored over 90% on a Grade 6 math test. A group of British children who had effectively been written off as too unruly responded so enthusiastically and had such impressive results using the JUMP method that the school board has adopted the program. Inspired by the work he has done with thousands of students, Mighton shows us why we must not underestimate how much ground can be covered one small step at a time, and challenges us to re-examine the assumptions underlying current educational theory. He pays attention to how kids pay attention, chronicles what captures their imaginations, and explains why their sense of self-confidence and ability to focus are as important to their academic success at school as the content of their lessons. When you place enough stress on results, research shows that even the most confident students will actively steer toward easier tasks.